On my regular ol’ blog, I post often about music. I apply music to life and think of it as making up a soundtrack to my own life and the world’s consciousness. It would seem strange if I didn’t carry the music over to this blog, so once in a while, I’ll share some songs that apply to social justice or have perseverance of the human spirit at it’s core. 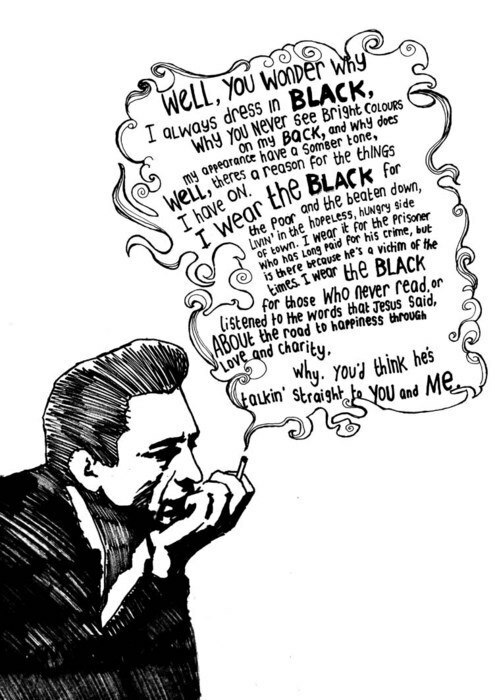 “The Man In Black” in particular is a great protest song. A lot of protest songs are angry and ranty but not so much this one. It simply and casually speaks about human compassion for others who are often vilified and a firm statement of solidarity. I do not know the artist who did this great illustration of the lyrics. If anyone knows, give them a shout out. Next Next post: Kale Me Now.